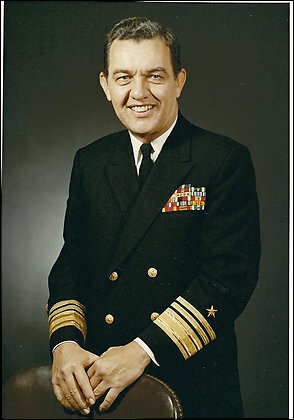 Retired Vice Admiral Jerome H. King Jr., 88, the Commander of U.S. naval forces in Vietnam who helped wind down the military branch's involvement in the Vietnam War, died June 13, 2008, at Huntington Hospital in Pasadena, California. He had chronic obstructive pulmonary disease and pneumonia. Admiral King held demanding assignments at sea and in the front offices of the Navy hierarchy. His most crucial mentor was Admiral Thomas H. Moorer, who became Chief of Naval Operations and Chairman of the Joint Chiefs of Staff. Moorer had taken note of Admiral King's skill and helped his protégé win several important jobs. The most public task was succeeding then-Vice Admiral Elmo R. Zumwalt Jr. as Commander of naval forces in Vietnam. Reporting to Saigon in 1970, Admiral King continued work started by Zumwalt overseeing the transfer of the Navy's small coastal and river combat boats to the South Vietnamese. This assignment was part of the U.S. strategy called "Vietnamization," in which the South Vietnamese took over more responsibility for military operations. "Vietnamization became frustrating to King because it wasn't the same desire to victory that had existed before," said historian Paul Stillwell, who conducted an oral history with Admiral King. "He presided over the diminishment of American capability there," Stillwell said, "and was not always confident of the South Vietnamese ability or willingness to take over the equipment and the roles" of the U.S. Navy operating in rivers and canals. After an 11-month tenure in Saigon, Admiral King was Deputy Chief of Naval Operations for surface warfare. From 1972 to 1974, when he retired from active duty, he was a key aide to Moorer, who was then serving as Chairman of the Joint Chiefs of Staff. Jerome Henry King Jr. was a native of Youngstown, Ohio, and a 1941 engineering graduate of Yale University, where he was in the Navy ROTC program. He received a master's degree in nuclear physics from the Massachusetts Institute of Technology in 1951 and became an authority on the effects of nuclear weapons. He began his Navy service in the Pacific during World War II and first rose to prominence in the late 1950s when Moorer was commander of Carrier Division Six, which operates mostly in the Mediterranean. Stillwell said Moorer took note of Admiral King's ability as a surface operations officer, who coordinates and directs operations of carrier formations at sea. In 1969, Admiral King was commander of an anti-submarine warfare group when he was asked to lead a delicate assignment. He was the senior member of a joint U.S.-Australia board of inquiry into a fatal collision between the U.S. destroyer Frank E. Evans with Australian aircraft carrier Melbourne during NATO maneuvers that month in the South China Sea. The panel primarily faulted the actions of the U.S. destroyer, which was sheared in half after turning at night in front of the carrier. Seventy-four U.S. sailors died. In 1970, Admiral King became one of earliest Navy ROTC graduates to achieve the rank of three-star admiral. Until then, almost all vice admirals had been U.S. Naval Academy graduates. His military decorations included three Distinguished Service Medals, two awards of the Legion of Merit, the Bronze Star with Combat V and two awards of the Navy Commendation Medal. He spent his retirement in Southern California and was a resident of Palos Verdes Estates. His marriage to Jane Bellows King ended in divorce. Survivors include his wife of 22 years, Annette Neely King of Palos Verdes Estates; three daughters from his first marriage, Judith Griggs of Norcross, Georgia, Anne McFarland of San Diego and Sally King of Snohomish, Washington; two stepsons, retired Navy Commander Timothy McElhannon of Lexington, Virginia, and Stephen McElhannon of Woodstock, Georgia; six grandchildren; and two great-grandchildren. Jerome H. King directed inquiry into collision. Vice Admiral Jerome H. King Jr., a retired three-star naval officer who in the early 1970s served as director of operations of the Joint Chiefs of Staff, has died. The Palos Verdes Estates, California, resident was 88. King died at the Huntington Memorial Hospital in Pasadena, where he was taken Friday after collapsing at his granddaughter's graduation ceremony at the California Institute of Technology. He was wearing a '41 Yale baseball cap - a tribute to his alma mater, which was also where he got an early start on his long U.S. military career. "He was a strong leader because he was a Yale graduate, he was a man of integrity, he was smart, and he told it exactly the way it was, whether you liked it or not," said Vice Admiral Jerry Miller, a close personal friend who served in the Navy with King. 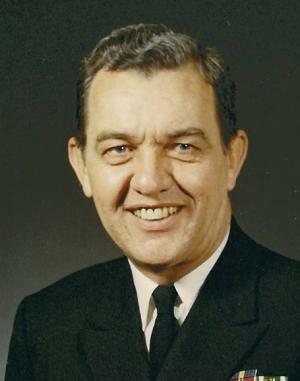 King also was known for his role presiding over the board of inquiry for a collision on June 3, 1969, between a Royal Australian Navy aircraft carrier and a Navy destroyer. Some questioned his review of the crash that killed 74 because he was the commanding officer of both forces involved in the military exercise. His service records include three Distinguished Service Medals, three Legions of Merit, a Bronze Star Medal and two Commendation Medals. "He described how much it meant for him to serve under 'Captain King,"' she said. "Jerry called this man and talked to him, and I just received an e-mail from a friend of that man who said that that call was the most wonderful thing he could have received before his death." Burial will be at Arlington National Cemetery. The family asks that any donations be made to The Wellness Community, 109 W. Torrance Blvd., No. 100, Redondo Beach, California 90277.